Review posted April 12, 2018. And it’s also applicable to something I’m doing lately – going to classrooms and talking about the Newbery Medal and what it’s like to be on the committee. 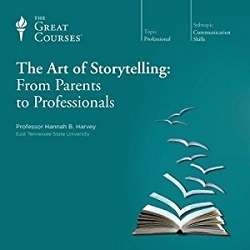 Listening to this course is helping me to focus on connecting with the audience and telling it as a story – not just as a list of facts about the medal. I was even on a county podcast, and the interviewer asked me *why* I would want to do this, and I floundered for a bit – and then thought of a story to tell that explains it - about that moment of thinking a book is so good, I wish I could tell the whole world about it. Being on the Newbery committee, I really get to do that!